Hello from Alice, the All Access guru. I am sad to report that this is my last week working with the All Access program as well as the Boston Harbor Explorers program here at Save The Harbor Save The Bay. This was by far the best summer experience I have ever had. When I applied for this job, I had no idea what I was getting into. I want to not only thank Janet, Patty, and Bruce for accepting me for this job, but I also want to thank everyone else on the staff for making this summer stand out. I mainly worked with David Coffin and Ibrahim in the All Access program and the experiences I had this summer are ones I will never forget! I have developed a new understanding and appreciation of our city’s history, environment, and surroundings. 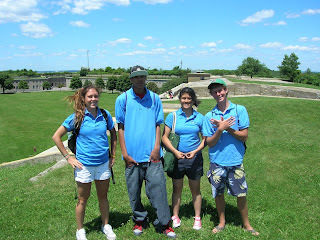 I have learned so much about different cultures through our staff, kids, and other counselors I have met on the trips. Some of my favorite memories from this summer include dominating kick-ball at staff day, teaching a girl to skip rocks across the water, watching a 20 year old counselor step on a boat for the first time, flying a kite for the first time, and singing sea shanties with David Coffin while touring the tall ships. My list of memories could go on for pages, but reading them just isn’t the same as experiencing them. If any of this interests you, I urge you to hop on board and see for yourself. I am going to miss everyone and I can’t wait to do it again next year!! Enjoy the rest of your summer!! !